The world is still waiting for a regular production electric car with a gearbox, but transmission manufacturers are rushing in with new products. 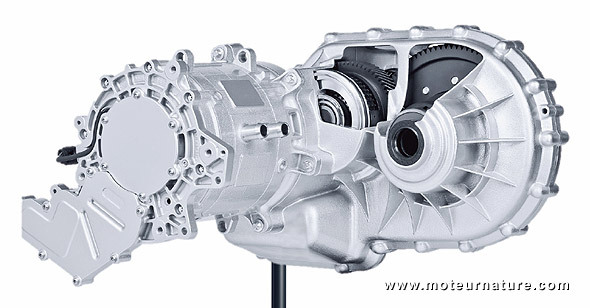 After Antonov and Vocis, both British, Getrag, the German specialist, unveiled its own transmission specifically designed for electric cars at the Frankfurt motor show. The German company built more than 4 millions gearboxes last year, mostly 6-speeds, but this new 2eDCT600 is a 2-speed unit. With a dual clutch set-up for driving comfort, by power shifting without torque break. Maximum torque input from the electric motor is 368-lbs/ft, so it should be right at home inside most electric cars, for better launch performance and increased top speed. Of course, main reason to use a gearbox is to save energy, and this 2eDCT600 transmission won’t disappoint there, immediately adding range to any electric car. Who will be the first to bring this essential progress to market?